BRÉBEUF, JEAN DE (called Échon by the Hurons), priest, Jesuit, founder of the Huron mission; b. 25 March 1593 at Condé-sur-Vire in Lower Normandy; martyred 16 March 1649 at the village of Saint-Ignace in the Huron country (in the region of Midland, Ontario), canonized 29 June 1930 by Pius XI and proclaimed by Pius XII on 16 Oct. 1940 patron saint of Canada along with his seven martyred companions. Among Jean de Brébeuf’s ancestors are said to have been companions-in-arms of William the Conqueror and of St. Louis, king of France, and his family, it is said, may be related to the English earls of Arundel. We know nothing of his immediate family. History has, however, preserved the names of two of his nephews: Georges de Brébeuf (1617–61), a minor poet of the 17th century, and Nicolas de Brébeuf (1631–91), prior of Saint-Gerbold, on the outskirts of Caen. When he was 24 Brébeuf entered the Jesuit noviciate in Rouen. After two years (1617–19) under Father Lancelot Marin’s direction he was appointed teacher of the first form in the secondary school (1619–20), then of the second form (1620–21) at the Collège in Rouen. During his second year of teaching he was incapacitated by illness, but he had enough strength left to prepare for the priesthood, which he received in 1622 at Pontoise. From 1622 to 1625 he stayed at the Collège of Rouen, where he held the office of steward. Then he was chosen for the missions in New France by the provincial of France, Father Pierre Coton. He sailed from Dieppe in April 1625 and landed at Quebec in June, along with Fathers Charles Lalemant and Énemond Massé and two lay brothers, François Charton and Gilbert Burel. Five months of a roving existence in the cold and the snow (20 Oct. 1625–27 March 1626) with a group of Montagnais Indians who lived near Quebec constituted his apprenticeship for the missionary life. Scarcely had he been initiated in the language and custom of the Algonkins when in the same year, 1626, his superior designated him, with Father Anne de Nouë, for the Huron country. In July for the first time Brébeuf travelled by canoe the 800 miles that separated Quebec from the Huron territory. The pages that he wrote later about conditions on this trip make of him, along with Champlain, Sagard, Chaumonot, and Allouez, one of the principal chroniclers of this great route to the West which missionaries, traders, and explorers long followed. This route led the travellers via the St. Lawrence, the Ottawa, the Mattawa, the Rivière à la Vase, Lake Nipissing, and the French River to Georgian Bay and the Great Lakes. This was a 20- to 30-day trip which the numerous portages, the tramping through the forests, the plague of mosquitoes, supply difficulties, lack of hygiene among the Indians, etc., often made exhausting. Ties which were already very old, dating from Champlain’s first explorations, linked the Hurons and the French. In a colony the existence and growth of which depended principally upon the fur trade, the Hurons were precious allies. Champlain had realized this. Indeed, the Hurons formed a compact, sedentary, agricultural group gifted with a real genius for trade. Their economy, which was relatively balanced and which was based upon the cultivation of the soil, supplemented in season by picking of fruit in summer, by fishing and hunting in the autumn, conferred upon them an undeniable superiority over the neighbouring tribes. From the time of their earliest contacts with the French, the Hurons realized that they were primarily interested in obtaining furs. Immediately they increased their trade. Taking advantage of their situation, which was economically and geographically privileged, they played the role of middlemen between populations with different kinds of economies. They accumulated in their villages huge quantities of furs that they bought from the nomadic hunters of the regions of Lake Nipissing, Lake Timiskaming, the Ottawa and St. Maurice rivers, and even the Hudson Bay territories. In return they offered these hunters corn, flour, tobacco, pumpkins, nets, which they obtained from their own district or from the tribes to the south and the west – the Neutrals, the Tobacco nation, the Eries, the Nipissings and the Ottawas. The Hurons thus became the great traders of the period. As soon as seeding was ended, they would load their canoes and go off to trade with the French, from whom they received European goods in exchange: metal arrow-heads, pots, hatchets, needles, fish-hooks, knives, blankets, and above all porcelain, a material more precious than gold in the Indians’ eyes. The alliance with the Hurons presented other advantages: it facilitated exploration of the interior of the country and permitted the establishment of settlement outposts in the St. Lawrence basin, and above all it furthered the evangelizing of the Indians. For the missionaries, the evangelization of fixed and friendly populations was incontestably more promising than that of the nomadic Algonkins. There was, however, another side to this alliance, which with the years was to prove to be formidable: in allying themselves with the Hurons the French were committing themselves to lend them military support against the Iroquois, their hereditary enemies. For years the fur trade, the development of the colony, and the evangelizing of the Indians would be dependent upon the assistance that France would give the Laurentian coalition (Algonkins, Montagnais, and Hurons) against the Iroquois. Initially this alliance brought about a great increase in the trade in furs and facilitated the missionary enterprise. Upon his arrival among the Hurons, Brébeuf took up residence at Toanché I, among the Bear tribe, the most important of the four great families in the Huron confederacy (the Bear, the Cord, the Rock, and the Deer tribes). The greatest benefit that Brébeuf derived from this first stay in the Huron country (1626–29) was no doubt, along with his apprenticeship in the language, a better knowledge of the Huron milieu. His efforts at evangelization met apparently with no success. In 1629 Brébeuf was recalled in haste to Quebec. He was present when the post was captured by the Kirkes in July and subsequently had to return to France with the other missionaries in the colony. He was appointed to Rouen and was assigned to serve the Church as a preacher and confessor. It was at this time (January 1630) that he took his final vows as a Jesuit. From 1631 to 1633 we find him at the Collège in Eu, acting as steward, minister, and confessor all at the same time. 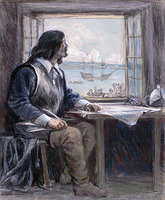 Brébeuf returned to New France in 1633, and the following year he went into the Huron country again, accompanied by Fathers Antoine Daniel and Ambroise Davost. This time he was entrusted by his superior, Father Paul Le Jeune, with the task of founding and organizing a real mission. From the outset the Jesuits of New France pinned their greatest hopes on this mission. 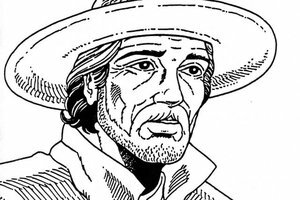 In Le Jeune’s eyes it represented a privileged testing-ground for the evangelizing of the Indians and was to constitute a sort of prototype which he intended to use as a model for the other missions. Brébeuf’s first act as superior was to choose a centre from which the work of the mission would radiate. After careful consideration, on 19 Sept. 1634 he settled at Ihonatiria (Saint-Joseph I), a village near Toanché, where he had stayed from 1626 to 1629. Until 9 June 1637 the Huron mission was confined to this one residence. After a relatively satisfying phase the work of evangelization soon met obstinate and increasing resistance among the Hurons. Brébeuf attributed this resistance to three factors: the immorality of the Hurons, their attachment to the custom of the country, that is, to everything that until then had made up their world of beliefs and pleasures, and finally the epidemics that ravaged the country. This last factor in particular greatly delayed the flow of conversions. The epidemics of 1634 (smallpox combined with dysentery), 1636 (malignant influenza), and 1639 (smallpox) reduced to 12,000 a population that Sagard, Brébeuf, and Champlain estimated at 30,000 souls. Contact with the Europeans was disastrous for the American Indians, taken by surprise by the viruses that had been brought from Europe. In this respect the Iroquois were better protected than the Hurons, since the Dutch and English settlers mixed little with the Indians and were content to wait for them in the shelter of their factories. In the Huron country these repeated scourges made the missionaries’ presence odious. The epidemic of 1636–37 roused the whole nation against Brébeuf and his companions. For months on end, under the direction of the witch doctors, a clever campaign was carried on, made up of hypocritical insinuations, then of open and violent threats, which were accompanied by attempts at murder. In the autumn of 1637 the whole mission almost collapsed. In this emergency Brébeuf sent to Father Le Jeune a sort of letter-testament in which he announced the possibility that all the missionaries might be massacred. At the end of August 1638, after founding a third post at Teanaostaiaë (Saint-Joseph II), Brébeuf handed direction of the mission over to Father Jérôme Lalemant, who had recently arrived from France. He himself became the superior of the residence that he had just founded. 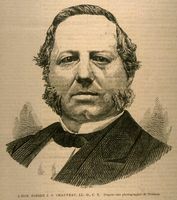 It was in this ministry that Brébeuf had to suffer the harshest persecution of his career. After a smallpox epidemic the dramatic events of 1637 were repeated, but staged even more riotously: crosses were torn down, stones were thrown at the chapel, there were beatings and threats with hatchets and flaming embers. During this storm Brébeuf even saw part of his flock desert the faith that they had just embraced. In April 1640 an uprising broke out, in the course of which Pierre Boucher* was wounded in the arm, while Brébeuf and Chaumonot were beaten. In the month of May the Indians’ tumult led Lalemant to give up the residence. 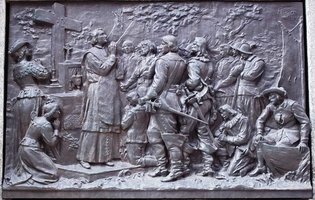 In the autumn of 1640, after taking counsel together the missionaries decided to start two new missions: one among the Algonkins, the other among the Neutrals. Brébeuf and Chaumonot were appointed to the latter. Preceded by secret Huron agents who depicted the missionaries as the most maleficent of witch doctors, the two of them travelled throughout a violently hostile region, rejected, abused, reviled everywhere. These were five months of fruitless labour (November 1640–March 1641). 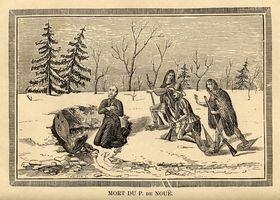 As a crowning misfortune, on the way back from this mission Brébeuf fell on the ice while crossing a frozen lake and broke his left clavicle. Father Lalemant felt that it was his duty to send Brébeuf back to Quebec and entrust him to a doctor’s care; at the same time he could fill there the post of mission procurator which Father Ragueneau held. In the spring of 1642 Brébeuf reached Quebec, after seven consecutive years with the Hurons. The task of procurator of the Huron mission consisted of supplying the missionaries with everything that they might need (books, paper, religious objects, etc.) and of organizing supply convoys for them. This was a painful trial for Brébeuf; twice, in 1642 and 1643, the convoys he prepared were seized by the Iroquois and were a complete loss. In addition to this function, during his stay at Quebec Brébeuf had to attend to the teaching of six young Hurons who had been entrusted to his care (September 1642–June 1643). He also served as confessor, spiritual director, and adviser to the Ursulines and Religious Hospitallers. And finally, on Sundays and feast days he preached and heard the confessions of the French inhabitants of Quebec. In 1641 the insecurity in New France and on the route to the Huron country became so great that Father Vimont, at the request of Governor Huault de Montmagny and of the settlers, sent Father Le Jeune to France to set forth the situation to the king and to Richelieu. In 1642 began the disasters which were to go on increasing each year. The Mohawks and Senecas launched a vast offensive which extended from New France to the Huron territory. Divided into small bands, they systematically blockaded the routes along the Richelieu, the Ottawa, and the St. Lawrence. The French colony was weak; it had only 400 inhabitants and had available only 100 soldiers. The Relations, which previously had been crammed with details concerning conversions and epidemics, no longer spoke of anything but massacres and pillage. The year 1642, which saw the founding of Ville-Marie, was marked also by the capture of Isaac Jogues, René Goupil, and Guillaume Couture*. In two years (1642–43) the mission convoys were captured three times, on the way either up or down. In 1644 Father Bressani was captured and tortured. The treaty of 1645 constituted only a short-lived truce in this nightmare, since Jogues was murdered in October 1646. During the summer of 1647 fear of the Iroquois was so great that the Hurons did not go down to Quebec. The years 1647–48 marked the beginning of the annihilation of the Huron nation. Until then the Iroquois had restricted themselves to surprising the traders’ convoys on the St. Lawrence and Ottawa routes. Now they were in the heart of the Huron country. In 1647 they massacred the population of a Neutral village. On 4 July 1648, taking advantage of the fact that the Hurons had gone trading, a band of Indians threw themselves upon the villages of Saint-Joseph and Saint-Michel and took 700 prisoners. Father Antoine Daniel fell, riddled with arrows. The village of Saint-Joseph II (Teanaostaiaë) formed with Ossossanë (La Conception) and Sainte-Marie the triangular base of Huron resistance. On 16 March of the following year (1649) more than 1,000 Iroquois attacked Saint-Ignace (Taenhatentaron), then Saint-Louis, where Brébeuf and Gabriel Lalemant were carrying on their work. They were taken prisoner and carried off to Saint-Ignace, where they suffered one of the most atrocious martyrdoms in the annals of Christianity. Brébeuf’s torture has been told us with moving simplicity by the donné Christophe Regnault, who saw his remains: “Father de Brébeuf had his legs, thighs, and arms stripped of flesh to the very bone; I saw and touched a large number of great blisters, which he had on several places on his body, from the boiling water which these barbarians had poured over him in mockery of Holy Baptism. I saw and touched the wound from a belt of bark, full of pitch and resin, which roasted his whole body. I saw and touched the marks of burns from the Collar of hatchets placed on his shoulders and stomach. I saw and touched his two lips, which they had cut off because he constantly spoke of God while they made him suffer. “I saw and touched all parts of his body, which had received more than two hundred blows from a stick. I saw and touched the top of his scalped head; I saw and touched the opening which these barbarians had made to tear out his heart. In the face of the Iroquois attack, instead of recovering themselves the Hurons were seized with panic. Almost the entire Bear tribe took refuge with the Tobacco nation. Others sought asylum with the Neutrals, the Eries, the Algonkins, or fled to the nearby islands. The Huron confederacy fell completely to pieces. As the residence at Sainte-Marie-des-Hurons had at its disposal only 8 soldiers, 22 donnés and 7 servants, the Jesuits decided to abandon it. On 14 June 1649 they set fire to the building and betook themselves with a few hundred Hurons to the Île Saint-Joseph (Christian Island), located a few miles from there in Lake Huron. The new establishment had scarcely been finished when a new misfortune was added to the previous ones; in December the village of Saint-Jean, in the territory of the Tobacco nation, was attacked and pillaged. On the Île Saint-Joseph the situation soon became desperate. Famine, contagious maladies, new attacks by the Iroquois, forced the missionaries and the Indians to leave. On 10 June 1650, 300 Hurons, accompanied by the Jesuits and their servants, set out in canoes for Quebec. In the spring of 1651 these fragments of the Huron nation settled down on the Île d’Orléans; soon there were 600 of them, under Father Chaumonot’s direction. Brébeuf’s apostolate in the Huron country lasted 15 years. The Huron mission died with him who had begun it. But by a striking contrast, at the same time as the nation was being crushed, its spiritual regeneration was taking place. The Relations, which for a long time could count the conversions only one by one, speak of hundreds and even of thousands of baptisms in the latter years. 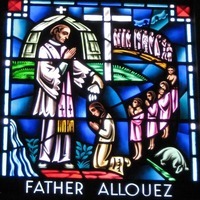 For the year 1649–50 alone, Father Ragueneau gave the figure of 3,000 baptisms. The consequence of the dispersion of the Huron nation was to spread the Christian faith among the nations of the Great Lakes basin and on the shores of the Rivière des Hollandais (Mohawk River). These converts were to form the elements of the Christian communities which the Jesuits were to go to found among the Iroquois and the nations of the west. What we know of Brébeuf comes to us from the Relations des Jésuites and especially from his own writings. These writings, very varied in nature, cover a period of 18 years, that is from 1630 to 1648. Among them are two Relations (those for 1635 and 1636), a spiritual diary composed of 44 fragments, 15 letters addressed to the superior general of the Society of Jesus or to local superiors, instructions or catechisms, a dictionary, a grammar, and even two Huron texts. Several of these writings have been lost. Those that remain, about 20, amounting to some 300 pages, enable us to recognize in Brébeuf the founder of missions, the ethnographer, the mystic, and the writer. The necessity for Brébeuf to understand thoroughly the milieu in which he was trying to evangelize resulted in a precious contribution to the ethnography of the Amerinds; 15 years of living with the Hurons allowed him to become better acquainted with their manners and customs than anyone else. Along with Champlain and Sagard, Brébeuf remains the most important witness of this period of first contacts. He lays stress for his part on the social, political, and religious life of the Hurons; in this respect he completes Champlain and enlarges upon Sagard. On these three points the 1636 Relation remains a unique document that is mentioned in first place in all the monographs concerning the Hurons. 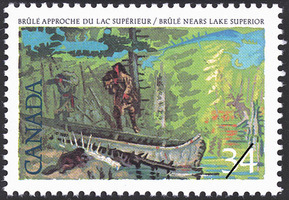 Brébeuf’s testimony is all the more valuable from the ethnological point of view in that it establishes the picture of the Hurons at the time when they were still themselves, before successive epidemics, war, and massacres had reduced them to the state of human wrecks; his testimony has all the interest and the intensity of a snapshot, so to speak. As the founder of the Huron mission Brébeuf was called upon to give it its earliest orientation. His administration was devoted to different tasks. First of all, there was the setting up of the first residences. During his superiorship he founded Saint-Joseph I at Ihonatiria (19 or 20 Sept. 1634), then the residence of L’Immaculée-Conception (9 June 1637) at Ossossanë, and finally that of Saint-Joseph II at Teanaostaiaë (25 June 1638). These posts, which were situated in the midst of the two main tribes (the Bear and the Cord), enabled him to become deeply assimilated into the Huron environment. Secondly, he applied himself to mastering the language. 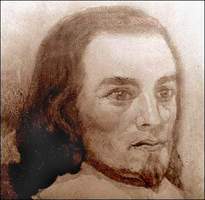 Brébeuf had been chosen the first time, in 1626, by Father Charles Lalemant to be the apostle to the Huron country because of his talent for languages. After his first three-year stay Brébeuf knew enough Huron to be able to translate the catechism of the Jesuit Ledesma. When he returned to New France in 1633, Brébeuf became Father Daniel’s and Father Davost’s teacher. As soon as they had arrived in the Huron country in 1634, their initiation continued, the team being completed by Fathers François Le Mercier, Pierre Pijart, Pierre Chastellain, Charles Garnier, and Isaac Jogues, all of them working under Brébeuf’s direction on the compilation of a dictionary and the preparation of a grammar. In 1639 mastery of the language had been achieved. This study, representing eight or nine years of austere and assiduous toil, was above all Brébeuf’s work. As a third task, when he had been initiated into the Huron milieu and was master of the language, Brébeuf undertook the major work of evangelization. After first working with the children, he soon realized that all depended upon the adults, in particular the chieftains and elders, who were the real sources of influence. The work of conversion advanced very slowly at first. The first conversion of an adult in good health took place in 1637. Four years later, in 1641, there were still only 60 Christians. Brébeuf’s correspondence and still more his spiritual diary reveal to us a soul that had manifestly entered upon the paths of higher prayer and that had long been familiar with divine communications. Three important commitments mark Brébeuf’s spiritual ascension: in 1631, the promise to serve Christ even to the sacrifice of his life; in 1637–39, the vow never to refuse the grace of martyrdom; in 1645, the vow of perfection. Several passages from the spiritual diary reveal that Brébeuf, like Jogues, had been favoured with a special vocation for the cross. From 1636 to 1641 insulted, beaten, stoned, jeered at, subjected to physical injury, Brébeuf was in the Huron country, like St. Paul, the “sweeping” of the world. Engaged in apostolic action, he was purified in that action and by that action. If in 1645, four years before his martyrdom, he was able to take the vow of perfection, it was because his soul had by that time long been completely submissive to God’s will. The consummation of this saintliness came to Brébeuf through martyrdom. 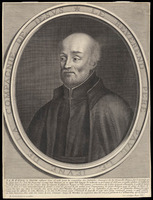 Among the influences which contributed to the shaping of Brébeuf’s soul one must mention especially St. Ignatius Loyola’s Spiritual Exercises, the Imitation of Jesus Christ, St. Paul’s letters, and then the probable influence of Father Louis Lallemant, a great 17th-century French master of the spiritual life. Finally, Brébeuf shows himself a writer without any pretentions, but a very gifted one. The two Relations in particular, in which Brébeuf recorded his observations as a traveller, ethnographer, and missionary, are written in very firm language of astonishing vigour, with a wealth of words and images, which had not yet been affected by the refining but impoverishing influence of the French salons. This language recalls the zest and the smile of Montaigne. Nowhere will one find more delightful observation or richer colour than in the chapters in which Brébeuf describes the conditions of life in the Huron country, the manners of the Hurons, the great Feast of the Dead. Nothing is more nobly lyrical than the Avertissement d’importance addressed to the young religious of France. Brébeuf’s language has not grown old. Humbler, but how precious are the few notes that remain to us from his private diary; these fragments represent the earliest pages of mystical literature in Canada. ACSM, “Mémoires touchant la mort et les vertus des pères Isaac Jogues . . .” (Ragueneau), repr. APQ Rapport, 1924–25, 3–70 passim. JR (Thwaites), VIII, X. Positio causae. Desrosiers, Iroquoisie. Jésuites de la N.-F. (Roustang). A. E. Jones, “‘ȣendake Ehen’ or Old Huronia,” PAO Annual Report, V (1908). R. Latourelle, Étude sur les écrits de saint Jean de Brébeuf (2v., Montréal, 1952, 1953). Félix Martin, Hurons et Iroquois. Le P. Jean de Brébeuf, sa vie, ses travaux, son martyre (Paris, 1877). Pouliot, Étude sur les Relations des Jésuites. J. Robinne, L’Apôtre au cœur mangé, Jean de Brébeuf: étude sur l’époque et sur l’homme (Paris, 1949). Rochemonteix, Les Jésuites et la Nouvelle-France au XVIIe siècle. F.-X. Talbot, Saint among the Hurons: the life of Jean de Brébeuf (New York, 1949). André Vachon, “L’eau-de-vie dans la société indienne,” CHA Report, 1960, 22–32; “Mgr de Laval et la menace iroquoise,” BRH, LXVII (1961), 36–46. 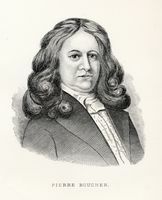 René Latourelle, “BRÉBEUF, JEAN DE (Échon),” in Dictionary of Canadian Biography, vol. 1, University of Toronto/Université Laval, 2003–, accessed April 20, 2019, http://www.biographi.ca/en/bio/brebeuf_jean_de_1E.html.